My daughter wants to try out for the track team next spring, but she can't really run well. How can I help her? - Energetic Juniors - Contact Us! My daughter wants to try out for the track team next spring, but she can’t really run well. How can I help her? As a concerned and caring parent you want the best for your child. One of the first things you do when your child expresses an interest in a particular sport is be supportive and excited. The second thing you do is kindly share a dose of reality. Dose of reality: It’s important to share with your daughter that track involves a lot of running and that this is something she needs to be prepared for. 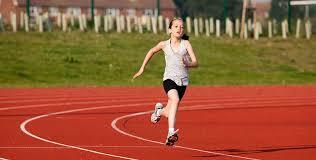 The support: If your daughter is still excited, you can get her prepared by having her do interval sprints. Find an open field, park or empty sidewalk. Begin by jogging to warm up. Slowly get into a steady rhythm and begin to sprint and see how far she can go without getting winded to the point where she has to stop. When finished with the sprint have her slow her pace down to a jog again and catch her breath at that steady pace. Begin with 5-8 sprints at a time, 2-3 times a week. As the weeks go on try to increase the number of sprints that she can do. Don’t forget to stretch at the end. This helped me cut my time drastically when I was marathon training. To submit your Ask the Expert questions please email it to bonita@energeticjuniors.com.